How to get there: From Trondheim, drive E-6 south to Støren, then Hwy. 30 towards the village of Røros. Before Røros, at the small place of Glåmos, there is a sign for Brekken, turning left and driving on the north side of the lake Aursunden. Continue east from Brekken to the Norwegian-Swedish border along Hwy. 31. If you drive the slightly longer route via Røros, then take Hwy. 31 via Brekken to the border. An alternative route (slightly longer measured from Trondheim) is to drive Hwy. 705 south directly from the Trondheim airport (Værnes) passing by the lake Selbusjøen, Tydal, the lake Stugusjøen and south across to Brekken, then to the border. The distance from Trondheim to the border is about 200 kilometer. From the border you drive 33 kilometer to the small village of Furnäs. Turn left where the signs say Ljungdalen. Note that the last section of the road to Ljungdalen normally is closed from 2200 until 0600 in the winter. This road may also be closed when the weather is windy. The best source of information regarding this road is to call 0611534319, they will know the situation and can advise on when the road will reopen if it is closed. If this road is closed, the detour further into Sweden and then back up into Ljungdalen is considerable (several hours of extra driving). Turn left in Ljungdalen and drive north-west following signs for Kläppen. The road ends at Kläppen where there is a good sized parking area. This is the trailhead, location N62:53.741, E012:42.612 and elevation 834 meter. From the trailhead to the hut: From Kläppen, head north-west, then more west as you enter the small valley Kesudalen along its southern side. You pass by Kesu (several huts), then continue on the south side of the lake Kesusjöen. You will observe a powerline heading more or less parallel to your route, this line actually heads directly to your destination Helagsstugorna. Ski or walk along the trail that climbs gently up and out of the valley, then continues on a course that is slightly north of west to Helagsstugorna. You will see a winter route (used by Swedes that prefer to drive their snow scooter in the wilderness), it is marked with poles and crosses, coming from your right. This route also runs directly to Helagsstugorna. The distance from the trailhead to the Helagsstugorna is about 12 kilometer. Helagsstugorna is located at N62:55.006 E012:30.376, elevation 1038 meter. There are several buildings, the very first one on your left hand side is open year round for self serve lodging. However, it may have limited facilities, read the comments below. From the hut to the summit: The mountain is clearly visible from the Helagsstugorna if the weather permits. Directly west of the huts, there is an entrance to a large bowl below the steep east face of the mountain. This bowl holds the southernmost glacier (a very tiny one) in Sweden. There are two routes to the summit. The most direct route proceeds directly up the hill just north of the bowl entrance, then follow the ridge west, later more south to the summit. The alternative route enters the lower part of the bowl, then crosses directly south-west towards the 1600 meter level where the ridge becomes slightly more distinct. From here, follow the ridge, contour slightly left (south) of the first hump on the ridge to gain the saddle from where the south ridge will lead you directly up to the summit. This route is the better ski route, it may still be most convenient to leave the skis at about the 1600 meter level and complete the ascent on foot. Comments: I did this climb with my friend Jostein Grepstad. Jostein and I have skied and hiked together quite a lot in younger days, thus this was a nice opportunity to refresh good company in the mountains. We drove from Trondheim shortly after 0800 in the morning and arrived at the trailhead around 1300. The local road to Ljungdalen was closed when we arrived at the closed gate, fortunately, the road reopened only minutes after our arrival. 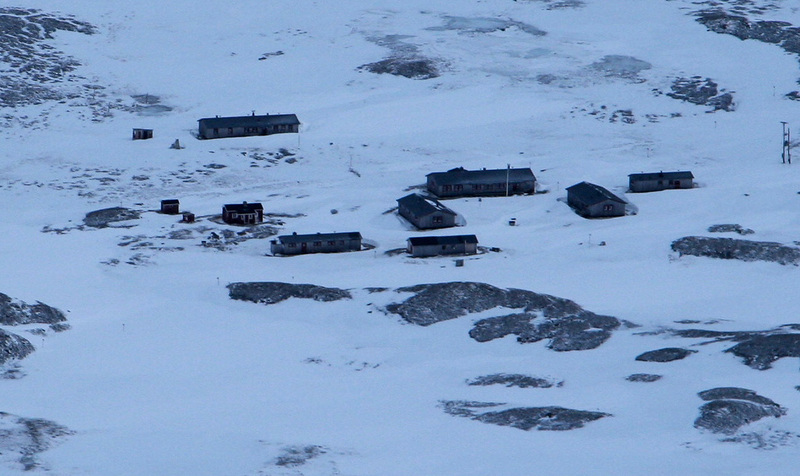 We skied from the trailhead to the Helagsstugorna cabins in about 3 hours arriving at 1600, just as it was getting dark. We had ok visibility, but pretty strong western wind hitting us directly in the face. 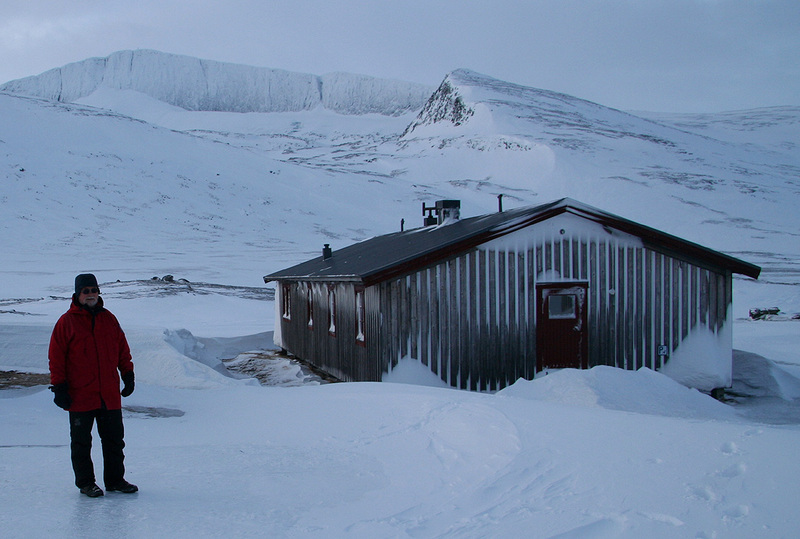 Helagsstugorna is a staffed hut in the summer season, providing a smaller, self serve hut in the winter. However, it turned out to have a few problems. The hut has electricity, however the main switch (inside the door on the left) was broken. In order to activate it and therefore get some heat from an electrical oven, Jostein applied some rather ingenious engineering while I was out to track down some firewood. More problems, despite two kitchen benches with overhead fans, the electric stoves were missing. It seems rather strange to assume that the hiker would carry an electric stove in his backpack, we wondered if the Swedes always do arrive on snow scooters and therefore easily will bring along such heavy equipment. Anyway, we needed to do all cooking on the rather small wood burning oven. Thus all preparations of our evening meal had to be sequential. First rice, then frying onions then the steak. With salad and a bottle of red wine, we had a luxury evening meal. The hut has 8 beds, there are blankets, pots and pans, silverware as well as plates and cups. Quite strange that they did not provide any cooking facilities. Members of the mountaineering association pay 100 SEK per night, the charge for non-members being only 150 SEK. We started out at 0900 the next morning, the conditions near our cabin was mainly ice and almost no snow. We assumed that the peak itself might have even more ice and that it would be rather unsuitable for skiing. 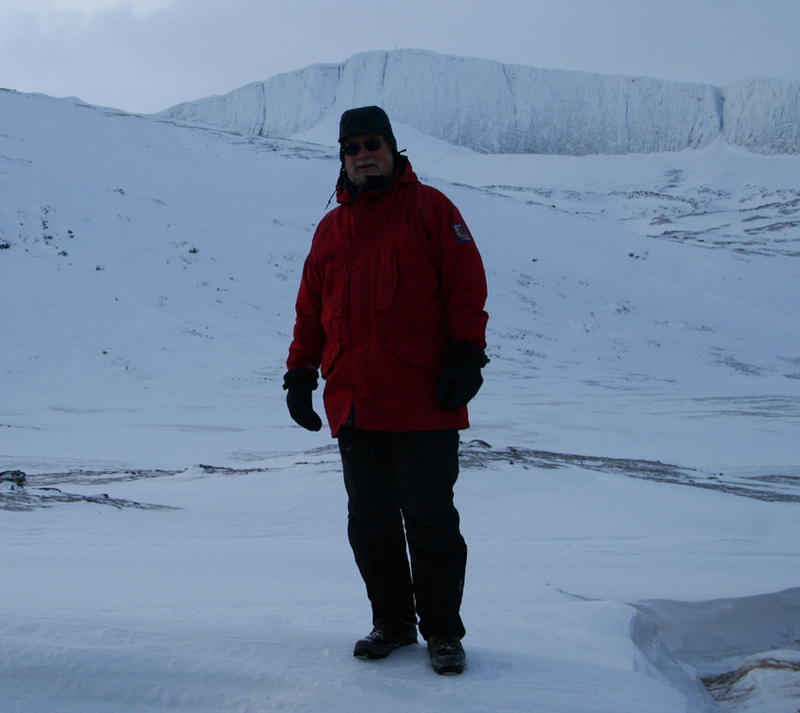 Thus, I set out on foot with crampons. Unfortunately, since we had only one set of crampons (my fault), we decided to split with me climbing the mountain while Jostein would aim for a somewhat easier peak with an antenna, this one seemed feasible to climb without crampons. I quickly gained the beginning of the broad ridge that eventually would lead me to the south ridge. The terrain turned out to be skiable to about 1600 meter, however this discovery came too late, as I advanced up the gentle slope on foot. Above 1600 meter, the ridge becomes somewhat more distinct, but never narrow. A small hump must be traversed or one may bypass it slightly on the left (south) side in order to arrive in the saddle from where the south summit ridge starts. I arrived at the summit at 1045, reasonably ok given the approach hike and the vertical gain of 750 meter all in snow and with crampons. The weather was cloudy, but the wind was much lighter than yesterday. 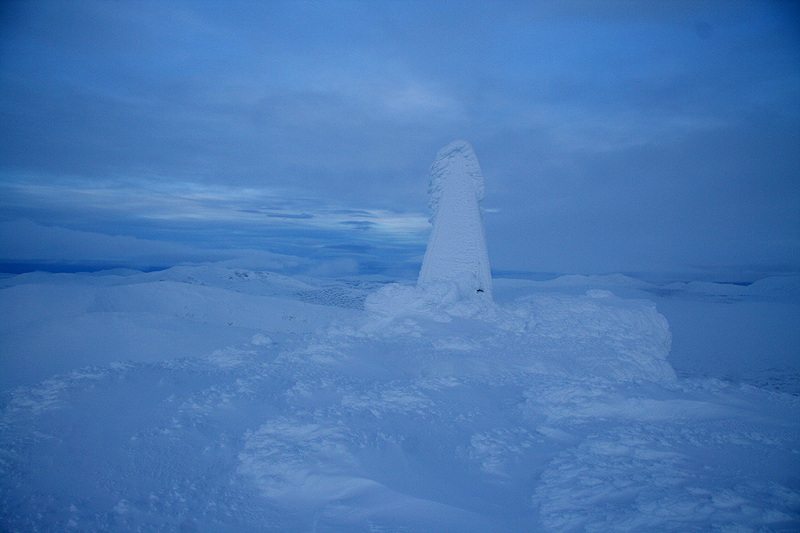 There is one regular cairn of rocks as well as another pretty tall summit marker (it stretches well above 1800 meter). After 15 minutes, at 1100, I started descending along the north ridge. It looked feasible to traverse the mountain and I decided to give this a shot. As it turned out, this ridge is very easy and leads nicely back down to lower terrain pretty close to the place where I started my ascent. This route, however, is less suitable for skiing. In fact, my route of decent may very well be the best route to the summit on foot. I was back at the hut one hour after leaving the summit, at 1200, noon. Since it was still early, we decided to ski back to the car and return to Trondheim. We left at 1240 and had a very nice and smooth ski back to the trailhead, where we arrived in 1:50, at 1430. Near Kesudalen, we met several Swedes out on their snow scooters. A family with man and wife on the scooter towing their two children in a separat unit behind. Out to experience the wilderness, exhaust and noise. What an enormous difference to Norwegian children that still should learn to cross country ski with their mom and dad. Helagsfjället, as seen when entering the bowl from the east side. Helagsfjället. Morning sun in early January. The fence is for reindeers, my route ascended from the left and descended the rightmost ridge. 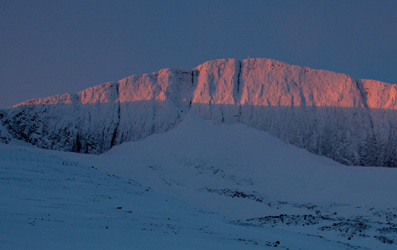 Helagsfjället, north ridge. Morning sun, this is a continuation of the ridge from the previous picture. Härjångsfjällen, as seen towards north-east from Helagsfjället. View west, the 1682 meter Predikstolen in the foreground. Helagsstugorna, as seen from the ridge, the self serve hut is the rightmost. Helagsfjället, as seen while descending the north ridge. Panorama north to east, as seen while descending the north ridge. Panorama east to south, as seen while descending the north ridge. Kesudalen with the lake is towards the left. There is nothing higher further south in Sweden. Jostein, 1200 noon, at Helagsstugorna. Helagsfjället behind. Jostein, one should dress well in January.